Pluto Closest Approach at 4:49 AM PST on Tuesday, July 14th. 371 re-targeting slews (utilizing 6 kg of propellant), 92 scans, and 36 mosaic sequences, accumulating to nearly 70 Gbits of data in order to accomplish 30 specific scientific objectives. This is New Horizons’ CORE (Encounter Command Sequence), an autonomous observation plan of the Plutonian system which initializes 7 days before (P-7 on July 7th) the closest approach of Pluto (P0 on July 14th), and ends 2 days after (P+2 on July 16th). Most of the 380+ observations occur during the 2 days before the closest approach, and 1 day after. This pre-programmed sequence accounts for more than 25,000 lines of software code, and will be uploaded to the spacecraft’s on-board computer 9 days before the Pluto encounter. The command sequence is a carefully-planned time choreographing of instrument pointing maneuvers. Although CORE is inherently reliant on the propulsion/attitude control system of the spacecraft in order to point the instruments one-at-a-time (since they are body-fixed), the scientific mission’s success is based on the spacecraft’s navigation arrival accuracy at the Plutonian system—which will be the focus of this long post. The navigators have one chance for success. The navigator’s purpose is to accurately deliver the spacecraft through the Earth and Sun occultations at both Pluto and Charon for scientific observations. This is not an easy feat. The spacecraft must reach the Plutonian system at a precise time and location, along a nominal trajectory, or else the occultations may not happen. In order to benefit the scientific instruments the most, the spacecraft must nominally pass as close to the center of occultation (i.e. the shadow, if a Sun occultation) as possible. After a 9.5 year interplanetary journey, New Horizons must hit a celestial bull’s-eye located nearly 5-billion km away (i.e. 4.25 light-hours) from Earth. The spacecraft, about the size and shape of a grand piano, is aiming for a 100 km by 150 km target—roughly the size of Connecticut. In order to be scientifically successful, it must hit its targeted area within ±100 seconds. As of June 28th (P-15), it’s current velocity (relative to the Sun) is 14.54 km/s. In 100 seconds, it will travel the distance from San Diego to San Francisco, round-trip. As of June 29, the mission is currently in its final approach phase (AP3) and in OpNav Campaign 4. AP3 will last from P-21 to P+1, in which Pluto will go from 26 to 1.2 million km away from the spacecraft (surface image resolution will decrease an order of magnitude, from 120 km/pix to 12 km/pix). OpNav Campaign 4 will consist of 5 LORRI 1×1 images per day. Since most of the moons (such as Nix and Hydra) became visible in the 1×1 images around this time, the 4×4 binning was not necessary anymore. Back in April (around P-170), the LORRI camera resolution exceeded that of the Earth-based cameras, such as the Hubble Space Telescope. The key advantage of optical navigation is as the spacecraft gets closer to its targeted body, the quality of its optical data gets better. However, optical data by itself is insufficient for orbit determination and must be used in conjunction with radiometric (Doppler, range, and ΔDOR) data. Radiometric data is always with respect to the Earth (since DSN is Earth-based), while OpNav is with respect to the spacecraft and the targeted body. Before getting into optical navigation (OpNav), I’ll quickly cover the instrument that navigation utilizes: LORRI. The navigators will use LORRI to take images of Pluto, Charon, and its other moons for OpNav purposes. Using these photos, they will be able to refine the precision of their predictions of where the spacecraft and planetary body will be, and when. LORRI is considered—rightfully so—New Horizon’s “eagle eyes.” Being one of the largest telescopes ever flown on an interplanetary spacecraft, LORRI is essential for the navigators. It’s a black-and-white (technically panchromatic), narrow angle (0.29 by 0.29 degree field of view), high-resolution (4.96 μrad/pix) imager with a 1024 by 1024 pixel CCD (digitally stored as 12 bits per pixel). In case of a failure of the primary navigation imager LORRI, Ralph’s MVIC can be used as a substitute. In Figure 3, the “blurring” of the bodies is actually their uncertainty in position. Navigators have a good idea of when and where each targeted body will be, but they don’t precisely know that information. It’s necessary to design the observations to maximize the chance of capturing the target within the instrument’s field of view. Hence, like on the Ralph scan, they will slew the instruments in the probabilistic area they believe the targeted body will be in. This way they can make sure that the pointing instrument will collect its possibly critical data. 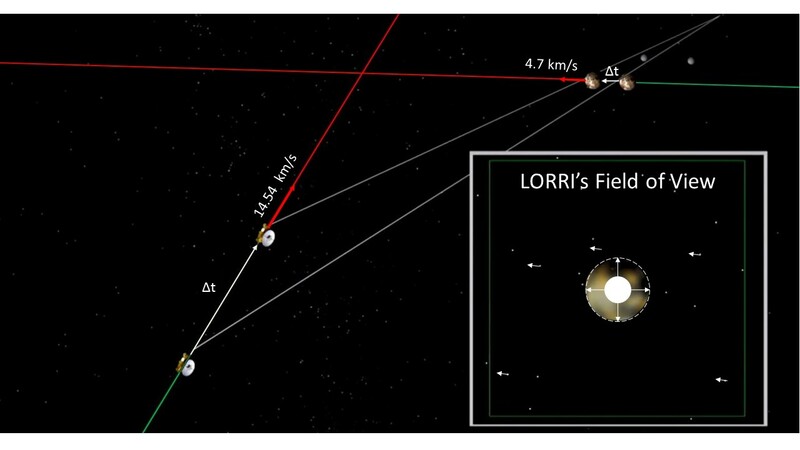 LORRI was theoretically able to detect Pluto back around P-510, and Charon around P-210, when their apparent magnitudes became bright enough. The OpNav campaign officially began back in July of 2014. At this time Pluto was only 0.5 pixel in size in LORRI’s field of view, but was digitally magnified by combining 4 raw images and deconvolving. Pluto was so far away that it was like trying to distinguish two buildings, with Pluto being equivalent to a 10-story building (Charon being half the size) located 2 blocks away in New York… looking from California. During the 1st campaign, the navigators were just trying to distinguish between Pluto and Charon and determine the distance between them. By the 2nd campaign, the navigators were beginning their ephemeris updates. 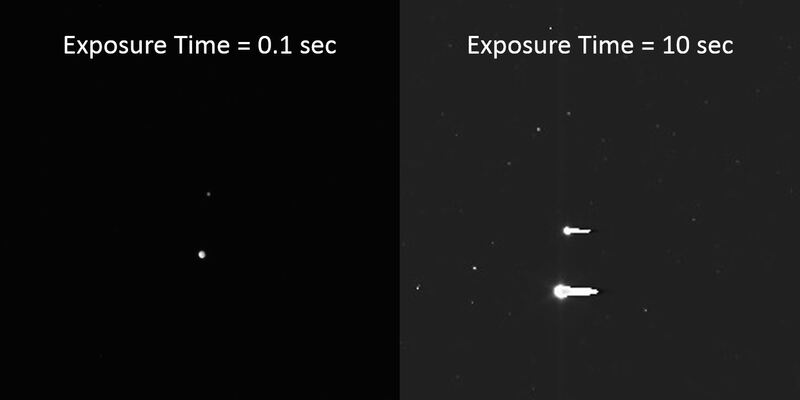 When viewing the LORRI raw images, you’ll see two more exposure times: 100 ms (0.1 seconds) and 10000 ms (10 seconds). LORRI’s image exposure times can range from 0 to 30 seconds, so occasionally you’ll see a few images with unique exposure times. The biggest difference in exposure times is one has less center-finding error (100 ms), while the other has greater signal-to-noise ratio (10000 ms). An important aspect of optical navigation is to determine where the center of a body is, with methods such as limb scanning. Center-finding provides the inertial line-of-sight vector of the targeted body with respect to the spacecraft. With multiple vectors at distinct times, the velocity of the spacecraft can be determined. Center-finding also helps determine the gravitational center of the system. However, as the target in the image gets larger, the error in center-finding also grows (we’re talking only about a few pixels at most, however navigators want to achieve sub-pixel error). The two navigation teams, INav at KinetX and PNav at JPL, have mainly been focusing on images of Charon because it is smaller than Pluto, and therefore has smaller center-finding errors. Very recently, they have been using Nix too. Noticeable on the longer-exposed images are the stars and other moons, which is another important determination for navigators. The foundation of optical navigation is to determine what stars are in the background of an image. The smearing effect is caused by pointing drift. Also, why are the raw images for the 10 second exposure images so small? These long-exposure images are 4×4 binned, allowing for determination of stars with an apparent magnitude of 18 (the higher the number, the fainter the star). Binning essential takes every 4×4 pixel area (16 pixels total), and combines the signal into 1 pixel. This greatly increases (improves) the signal-to-noise ratio. However, as a consequence, the image resolution drops down to 256 by 256 pixels. ¼ the resolution, with ¼ the noise—that’s a fair trade-off. With these images, navigators will also be able to determine Kuiper Belt Objects (KBOs) that are only 50 km in diameter. Orbit determination: the knowledge and prediction of the spacecraft’s position and velocity. Flight path control: commanding the spacecraft’s propulsion systems (thrusters or main engine) to change the spacecraft’s velocity. Planetary positions about the Plutonian barycenter. New Horizons’ trajectory with respect to the Sun. Where does optical navigation fit in? As we will see soon, #2; OpNav images help refine the positions of Pluto and its moon about their barycenter. Flight path control won’t be considered in detail, other than the mentioning of trajectory correction maneuvers later. Optical navigation uses a spacecraft’s camera to take pictures of a foreground target against a background of stars. These stars are then referenced with catalogs to determine where the instrument’s line-of-sight vector. New Horizons has a star catalog of 3,000 stars on-board (used for attitude control, such as in conjunction with star trackers), but optical navigation calculations are primarily done on-ground. Star catalogs referenced on ground, such as the Tycho catalog, can exceed 2.5 billion stars. Optical navigation images will improve the spacecraft’s trajectory knowledge with respect to the Plutonian system. 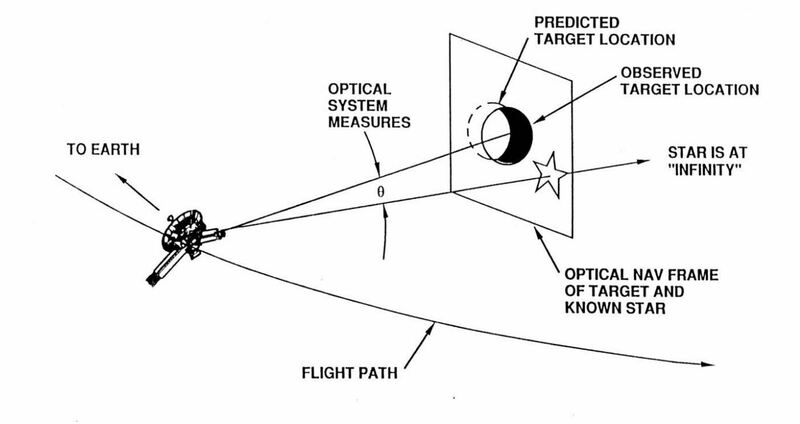 Given the epoch of the observations, navigators can essentially determine the inertial state and attitude of the spacecraft, as well as the inertial positions of the target bodies (as viewed from the spacecraft). Orbit determination error relative to Pluto is a statistical combination of the spacecraft and Pluto ephemeris error. Referencing Figure 7, the distinction between the predicted and observed target location is important. The boresight is the center of an instrument’s field of view (refer to the bottom-right of Figure 10 for visualization). A predicted boresight is provided by the flight dynamics/attitude control team. When an image is captured, the actual boresight is processed from the star background. Navigators are use ephemeris determine where the body center should be, and where the observed center is. This information of comparing estimated (a priori) to observed (actual) leads to residuals, which are how far off the predictions are. With the residuals, corrections in ephemeris errors can begin. Time: when New Horizons will be at its closest approach of Pluto. Information about time is primarily extracted from parallax measurements. Position: where both New Horizons and Pluto will be during the closest approach. Position and velocity are determined with B-plane calculations. Gathering a sequence of OpNav images, each with at least 5 images (hence why New Horizons typically takes a series of 5 images) and several guide stars in the background. Project Navigation (PNav) at KinetX, using MATLAB. 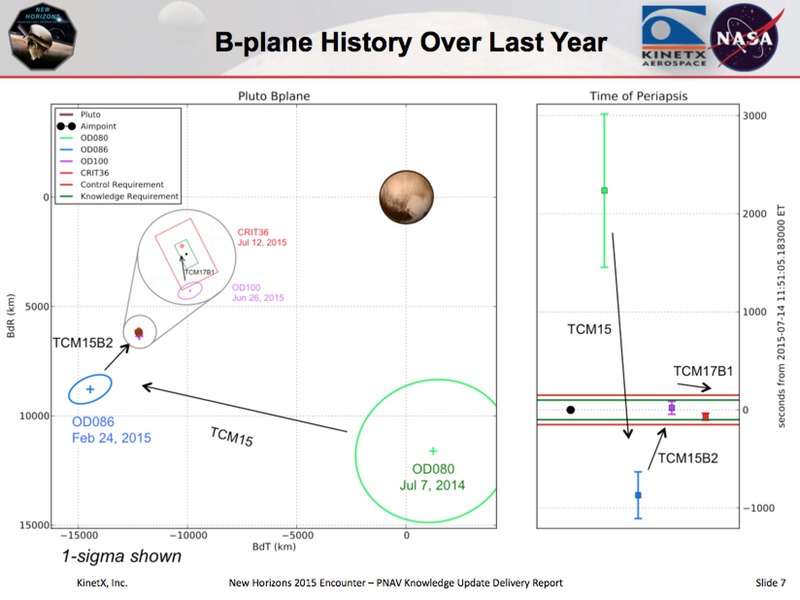 Independent Navigation (INav) at JPL, using FORTRAN and C.
Interplanetary spacecraft approach trajectories to planetary bodies are described in aiming plane coordinates, referred to as “B-plane” coordinates (see Figure 8). The dispersion ellipse depicts the 1σ trajectory errors in the B-plane. What does this all mean? It’s a method of determining the probability of where New Horizons will be when it encounters Pluto. The dispersion ellipse is the probability, or certainty, that the spacecraft will arrive to a position somewhere in that area when it crosses the aiming plane. For a 2-dimensional Gaussian distribution, 1σ represents 39% certainty. Where does OpNav fit in with this? Along with radiometric data, it helps determine both the position and velocity in the B-plane. From a far distance, images of Pluto (with a star background) provides a strong determination of the direction of velocity at the B-plane. From a close distance, discussed a few paragraphs below, time-of-flight error can be extracted via position parallax associated with Pluto’s angular motion. The current predicted (1σ) arrival error in the aiming plane is a tiny 20 km diameter circle, well within the desired 100 by 150 km box area. The estimated spatial coordinates B dot T and B dot R are roughly -12,250 km and 6,135 km, respectively. Pluto is centered on 0,0. Viewing Pluto from the aiming plane, this is basically “down and to the left” of Pluto. Figure 9 is to scale (don’t get confused with the magnification bubble, that’s just for a zoomed-in perspective)… just pause for a second and think about how incredible the navigators were able to steer New Horizons. That little tiny circle, just about 20 km in diameter, labeled CRIT36 is where New Horizons will arrive within 39% certainty on July 14th. This is well within both the control and knowledge requirement for the mission. As of now, it looks like the spacecraft will arrival to Pluto about 70±40 seconds early from its nominal aim-point. To say that’s incredible for a 9.5 year time-of-flight is an understatement. As the spacecraft gets closer to Pluto, the resolution of LORRI’s pictures will get better (and Pluto’s apparent diameter will get larger). In order to know Pluto’s position, navigators rely on the parallax effect. By determining how fast Pluto appears to change in position against the fixed background stars, Pluto’s apparent position (with respect to the LORRI camera) can be derived. By utilizing difference reference frames, navigators can determine the position of Pluto from the Earth, Sun, or New Horizons’ inertial reference frame. 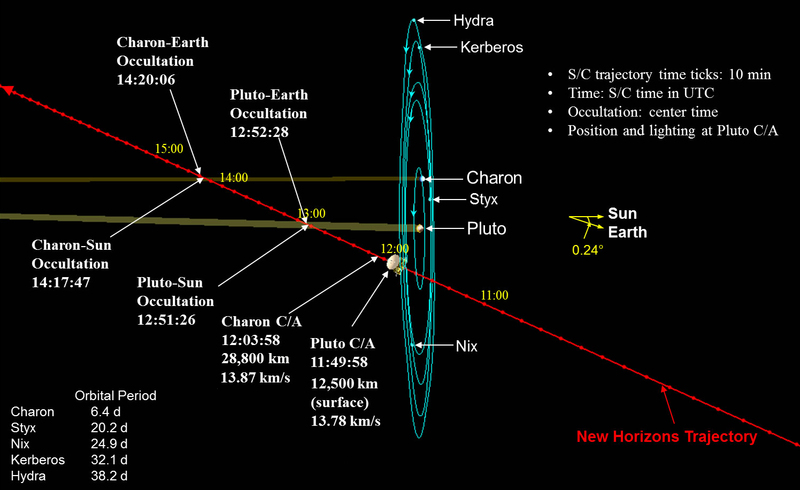 Timing information will be accessible when the geometry derived from New Horizons and Pluto has changed enough so that the spacecraft’s incoming velocity vector makes a significant angle with the line-of-sight of the target. This means that the last few days of OpNav images are absolutely critical in determining when the spacecraft will reach Pluto, and therefore crucial in determining when and where to point each instrument. When new estimates of the arrival time are obtained, the navigation team can send their updated instrument-timing sequences to NASA for approval. There’s two types of trajectories that navigators are interested in: the reference (or nominal) trajectory based on a priori assumptions, and the estimated trajectory based on data. The astrodynamists/mission designers determine the reference trajectory, the navigators determine the estimated trajectory. One is ideal, one is actual. The Navigators will propagate their estimated trajectory forward to see how off-course it is from the nominal trajectory. If there is a slight discrepancy, a trajectory correction maneuver (TCM) will be performed. TCMs are propulsive maneuvers used to correct any trajectory errors—they are trying to bring the spacecraft back on-course with the nominal trajectory. Since they are reliant on the orbit determination solutions, these maneuvers are statistical in nature. Basically, everything is statistical in the field of navigation. Although the spacecraft is traveling at 13.8 km/s, these TCMs are only about 1 m/s. 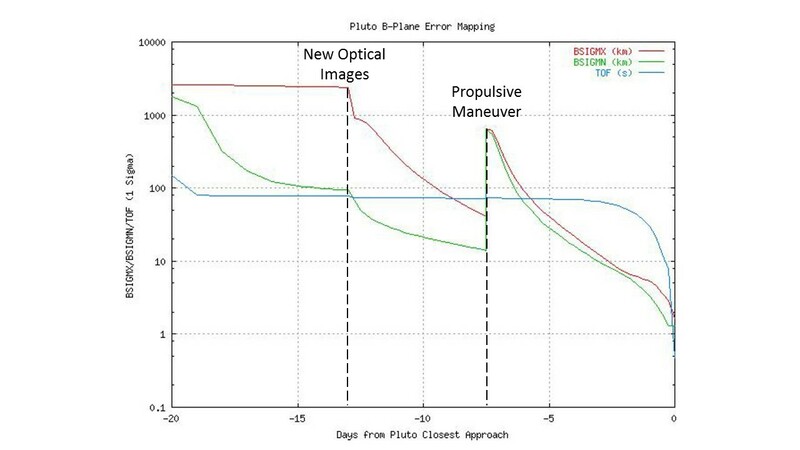 It’s incredible how even a small TCMs can have a drastic impact on the spacecraft’s trajectory error: just a 1 mm/s velocity error results in a position error of nearly 1 km (at Pluto’s B-plane) in 10 days! Figure 12 shows just how well OpNav images (with radiometric data) of Pluto and Charon can improve the orbit determination of the spacecraft—and just how much a TCM can screw things up! Although this is an outdated simulation (there will be no TCMs 1-2 weeks before closest approach), it does show just how sensitive variables are to navigators. Time of flight (TOF, blue line) error only significantly reduces when New Horizons’ is close enough for position parallax. Whenever a TCM is preformed, the spacecraft’s position error (in the B-plane) increases. Once radiometric data and optical images are acquired, the B-plane error can be reduced with knowledge updates. This positional error spike after a TCM is why none will be preformed after P-10. Remember how orbit determination required knowledge of the Plutonian barycenter?Determining the barycenter of the system is important for the positional accuracy obtainable with OpNav images. To make the dynamics even more complex, Pluto are Charon are waltzing together. The barycentric view of Figure 13 shows the common center of gravity of the Plutonian system, and this (the gravitational field) is just one more variable for the navigators to figure out in order to make this mission a success. Because a system’s semi-major axis is inversely proportion to its mass, the mass ratio can be determined by observing the motion on a star background over some time. Pluto encounter day (P0): Tuesday, July 14. Don’t expect any images on P0; New Horizons will be too busy preforming science rather than transmitting data back to Earth. Even during occultation, when the high gain antenna is Earth-fixed, the spacecraft will be receiving data (from DSN) but not transmitting any science data. The only transmission received at DSN from New Horizons on P0 will be the signals to tell us it’s still alive. The duration from closest approach (C/A) to Charon-Earth occultation is 4.5 hours, a little less than the time of flight from San Francisco to Hawaii—a trip I’m doing right now while writing this blog. I’m only traveling at Mach 0.73; New Horizons will be traveling at Mach 43. The last (and best) full-frame image of Pluto (3.847 km/pix) from LORRI will be downlinked on July 13 (P-1), a day before the closest approach, sometime in the evening around 7:30 pm. On Wednesday, July 15 (P+1), we should expect a few downlinks with LORRI images during the 1st Look Playback. For us in California (WDT): between 2:30 and 4:30 am we will receive a 3.227 km/pix image of Hydra, a 2.952 km/pix image of Nix, and a 2.329 km/pix image of Charon. A few hours later, around 9:30 am, we will receive the first mosaic (3 images) of Pluto at 0.386 km/pix resolution! The total mosaic will consist of 15 images, of which the next 4 images will be downlinked on July 20th (P+6). The other 8 images “will come later,” sometime after August. In September, we should received some selected high priority data. A “browse” dataset will be transmitted by November. Due to the slow transmission rate, it’ll take New Horizons 16 months to send all its data. 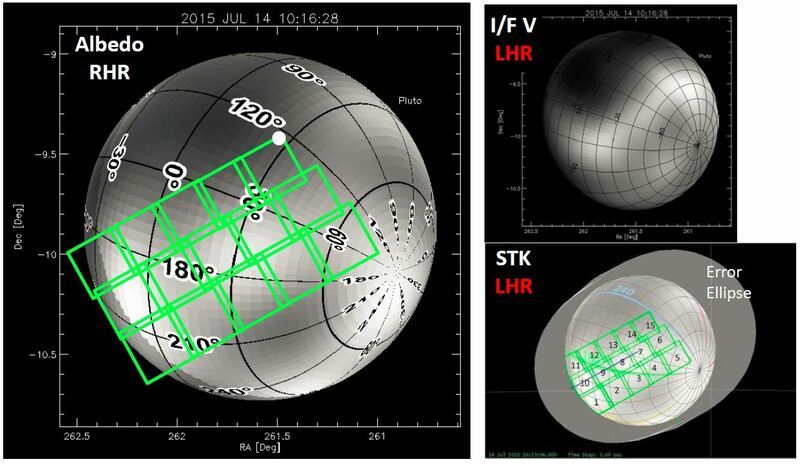 The complete data set from the Pluto encounter won’t be finished downlinking until late 2016, around November. I should really write a conclusion, but it’s currently 2:27 AM and I’m sort of doubting anyone will even read this far. Maybe I’ll add one shortly, along with all my references. Optical navigation is an amazing field in spacecraft systems which is certainty under-appreciated. When the images and scientific data begin to pour in (well, maybe drip since the datarate is so slow), be sure to think of the navigators. In addition to viewing the soon-to-be breathtaking photos of Pluto as aesthetically beautiful (and scientifically beneficial), add in the new dimension of also being a remarkable accomplishment of engineering and navigation.